he diameter of spinning cans has significantly increased over recent decades. Cans with a diameter of 1,000 millimeters (mm) are well-established today. At ITMA 2015 in Milan, Italy, Germany-based Trützschler GmbH & Co. KG presented many innovations including spinning cans with a 1,200-mm diameter and a filling station for cards that changes 1,200 mm diameter cans with significantly higher card delivery speeds than existing rotary can changers. The Institut für Textiltechnik der RWTH Aachen University (ITA), Germany, examined the profitability and effects on the amount of manual work required by the innovation. The study was performed on two sample processes for a new investment into a spinning mill. The typical production processes for carded and combed ring spun yarn were analyzed. Based on the typically used conventional cans with a 1,000 mm diameter, the profitability of the additional investment in cans with a 1,200 mm diameter was studied. To ensure a realistic calculation of the cost efficiency, the process chains analyzed were calculated for installations in Turkey, which produces Ne 30 ring spun yarn, carded; and India, which manufactures Ne 30 ring spun yarn, combed. Figure 1: Trützschler card with T-MOVE filling station and 1,200-mm diameter cans. Photograph courtesy of Trützschler. The series of assumptions were made for the calculation of the profitability of 1,200 mm spinning cans. A Greenfield scenario was used. Whether the extra investment for machinery and cans with a 1,200 mm diameter is cost efficient for a new investment was analyzed. In order to eliminate the effect of volatile exchange rates, all calculations are made in U.S. dollars. The costs for staff, production area, capital interest rates and annual operating hours are based on the “International Production Cost Comparison 2014” compiled by Switzerland-based International Textile Manufacturers Federation (ITMF). Thus the capital interest rate amounts to 9.3 percent in Turkey and 12.8 percent in India. The flyer production uses 600 mm cans at maximum. Thus the Trützschler TD 8 draw frames fill the sliver into cans with a 600 mm diameter in both cases. The height of the cans is 1,200 mm regardless of the diameter of the can. Therefore the material quality remains unaffected by the increased volume because the compression of the material remains constant. The increase in efficiency of the card was calculated to be 1.1 percent. This originates from the bigger can diameter, as well as the new filling station that performs can changes at higher delivery speeds. Therefore fewer and faster can changes are performed. As the additional investment is analyzed, only cash flows that occur because of the use of 1,200 mm cans were taken into consideration. The following costs and earnings are considered for the calculation of the profitability. The initial investments considered are machine costs and the required number of cans. The retail price for a card increases by approximately 6 percent if a T-Move filling station is used. 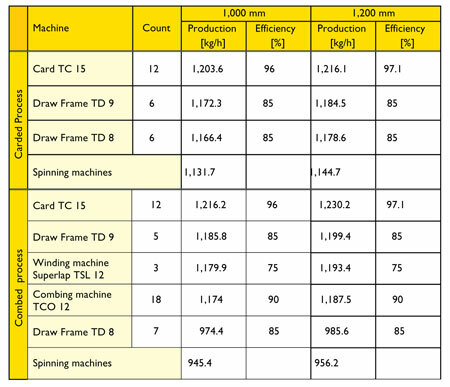 The costs for other machinery increases by 5 percent — draw frame TD 9 and combing machine TCO 12. These assumptions were made in agreement with Trützschler. The price of the spinning cans increases proportionally with the increase in volume by approximately 40 percent. The number of cans required for production is based on the average amounts for material buffer and handling. The operating costs and earnings consist of the cotton price and the retail price for the produced cotton yarns. The cotton price amounts to $2.06 per kilogram (kg) in Turkey, and $2.21 per kg in India, according to ITMF’s International Production Cost Comparison 2014. The price is based on the average cotton price of the last week of May 2014. The retail prices for cotton yarns and noils obtained by the spinning mills were taken from a survey consulting different yarn traders and spinning mills in September 2015. The determined prices in September 2015 were scaled to the last week of May 2014, based on development of the stock exchange price for cotton, in order to eliminate effects through different cotton prices. The net present value and the payoff time of the additional investments were calculated for the representative spinning mills. The net present value of an investment is the sum of all present day values of all cash flows, discounted using the capital interest rate. If the net present value is positive the additional investments are generally cost efficient*. The payoff time is the duration it takes for the net present value of all cash flows to add up to zero, or a positive value*. In other words, the payoff time specifies how quickly the additionally invested money is regained. The shorter the payoff time the lower the economic risk by unforeseeable effects like the volatility of the cotton price. In economic practice, a maximum payoff time of three years is often used to make investment decisions. 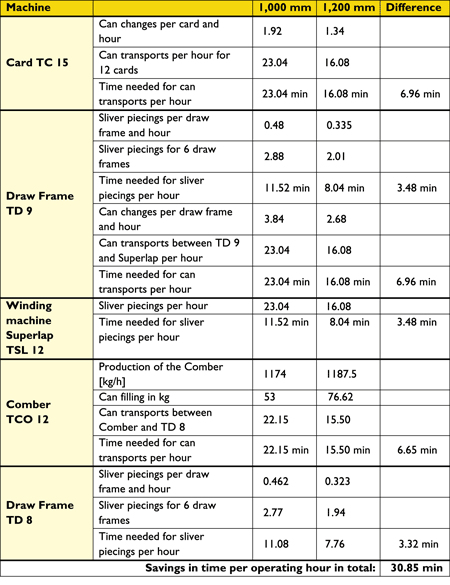 The effect on the productivity of the analyzed spinning mills of the additional investment in spinning cans with a 1,200 mm diameter is shown in Table 2. The effect may seem small, but over a 10-year operating period a significant effect arises, as shown in Table 3 and Figure 3. 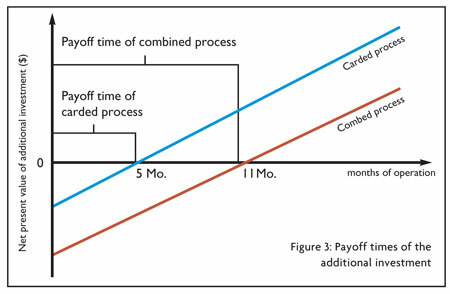 The longer payoff time of the combed process originates from the higher initial investment compared to the carded process. The 18 combing machines equipped with 1,200 mm can filling stations are critical for that. Nevertheless the higher payoff time of 11 months is lower than the maximum payoff time of 36 months which is used in economic practice. Therefore the cost-efficiency of the additional investment in a spinning mill that uses cans with a 1,200 mm diameter is hereby assigned. Beside the financial profitability, the effect of bigger spinning cans and a T-Move can filling station on the amount of manual work was examined. Because of the higher volume, fewer can changes occur on all machines equipped with 1,200 mm cans. The machine operators are able to save a significant amount of time with fewer can transportation processes. 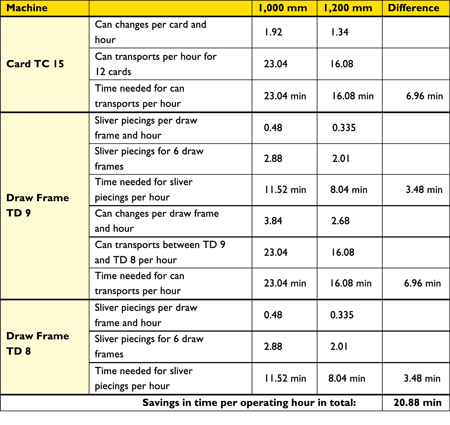 Time savings are calculated as shown in Tables 5 and 6. The time needed for one can transport between two machines was estimated at 1 minute. The time needed for piecing all slivers after the gate of a draw frame has run empty was estimated at 4 minutes. The time for piecing a sliver in the comber was estimated at 30 seconds. Depending on the mill size, the time savings allow a reduction of operating staff or an extension of the tasks of the operator, for example to clean machines. It is to be expected that errors such as sliver breaks can be repaired quicker if bigger cans are used because the operators are less bound in transportation or piecing tasks. The study looked at whether the investment in spinning cans with a 1,200-millimeter diameter and modern can filling station is cost efficient. The effect on the amount of manual work also was analyzed. Characteristic values for the cost efficiency are the net present value and the payoff time of the additional investment for a Greenfield scenario. 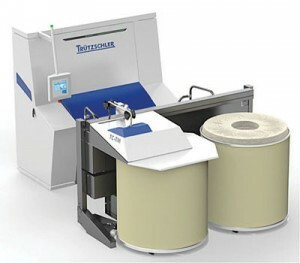 The calculations are based on two representative spinning mills for combed and carded Ne 30 ring-spun yarn. The payoff time amounts to 5 months for carded yarn, and 11 months for combed yarn. The higher payoff time of the combed process originates from the necessary equipment of the combing machines with 1,200 mm can filling stations. Because there are fewer can changes, 20 minutes per operating hour can be saved for the carded ring-spun yarn process, and 30 minutes per operating hour is saved with the combed yarn process. Editor’s Note: Frederik Cloppenburg and Alexander Janßen work in the textile machinery department; and Dr. Thomas Gries is a professor and head of the Institut für Textiltechnik, the textile machinery and processes research arm of RWTH Aachen University, Germany.